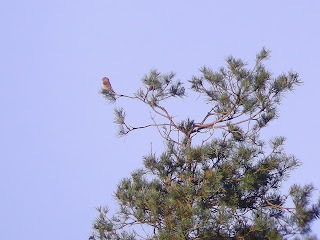 Parrot Crossbills have been making the birding news of late. Lee Evans predicted an influx of them this autumn and in the south-east he has been proved right. A group of four appeared in Essex a week and a half ago near Southend at Gunners Park, Shoebury. They showed ridiculously well by all accounts, and then another four (who knows, maybe part of the same group), appeared with a flock of Common Crossbills at Hemsted Forest near Cranbrook in Kent, along with a male Two-barred Crossbill. These particular Crossbills have been on show regularly and predictably for the past week, and having not yet seen a Parrot Crossbill, I was keen to go for a visit when I could. This was proving difficult, as this is annually my busiest time of the year work-wise, but last Saturday I managed to get out by 2.30pm and head off. This was at the same time a Semipalmated Plover appeared on Hayling Island, but this American mega didn't really interest me that much. A small wader that pokes around in the silt didn't really appeal. Crossbills are far more entertaining. They are noisy, active and constantly on the move when not feeding – a bit more of a challenge to find the rarity in amongst them. The excursion proved to be an unmitigated disaster and totally fruitless barring hearing the Two-barred fly overhead while on a two-mile trek through the woods, having parked at the wrong location, due mainly to the vague directions I could get via the Rare Bird Alert site. If I'd parked in the right place the walk would have only been about 300 yards. Having eventually and accidently found the right spot – I turned my head and saw a bank on scopes pointed at me as I walked up into the clearing – it was too dark and too late to see anything. I waited until yesterday morning for another stab. The weather forecast promised clear skies and little or no wind. I parked in the right place, walked up to the right area, and within a minute I was looking at a Parrot Crossbill, perched up in the pines with some Common Crossbill alongside for a comparison. Much heavier built from the neck up, its powerful bill showed up well as a silhouette against the sun, before it eventually perched closer for a better view with the sun behind. It stayed put for a good five minutes or so before flying further away and eventually out of sight with its Common counterparts. After an hour wait, another flock arrived and dropped in to a lone oak tree about 100 yards away. 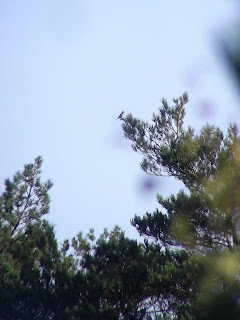 Another (or the same) Parrot Crossbill was spotted in amongst the flock of about 20 birds. The flock flew off and then all was quiet. 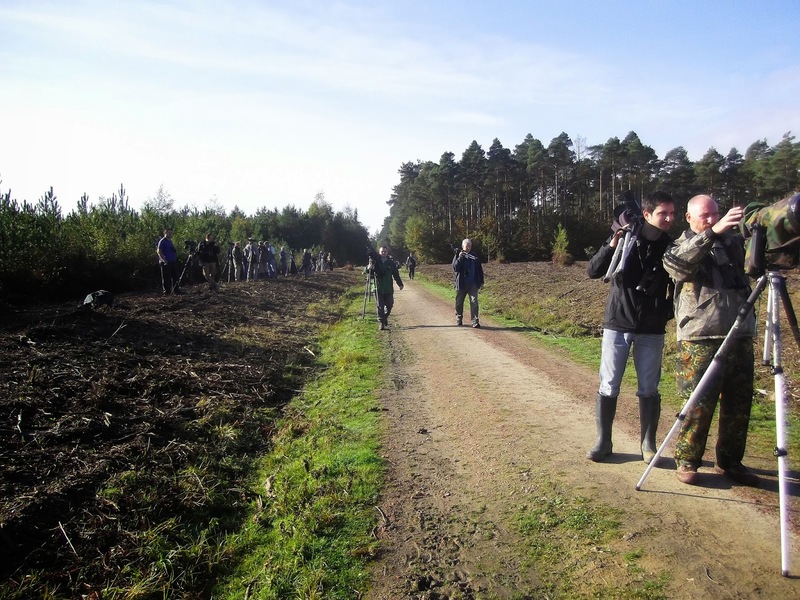 Crossbill flocks came and went during the next hour – as did a lone Yellowhammer, three Brambling and a five or six Bullfinch – but most flew straight on and didn't land. I was just about to head back home when yet another flock of around 15 birds landed in some silver birch in the mid-distance. 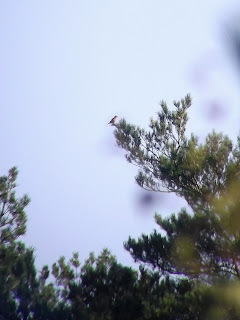 Shouts of Two-barred Croossbill echoed around the forest as the flock flew up into some pines. And there, perched high on its own was the male Two-barred Crossbill! Amazingly, my fourth from three locations in just over a month. I'm not sure how or why I have such luck with this rarity, but for some reason I rarely dip this bird! So a hat-trick of Crossbill species in one visit. Can't asked for better than that.